Attorney General Jeff Sessions fired back at President Trump Thursday after more criticism about his handling of the Justice Department. 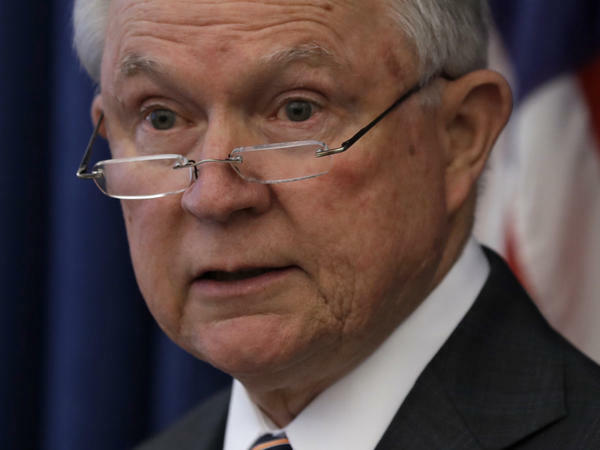 Attorney General Jeff Sessions answered needling by President Trump on Thursday with a vow that as long as he runs the Justice Department, it won't be swayed by politics. Sessions' statement was a rare broadside in response to TV and Twitter criticism by Trump of the department, which he and supporters accuse of perpetuating a "witch hunt" in the Russia investigation and going soft on Democrats. "I demand the highest standards, and where they are not met, I take action. However, no nation has a more talented, more dedicated group of law enforcement investigators and prosecutors than the United States." Trump's latest complaints about Sessions — from whom he has kept an icy distance for months out of frustration about the Russia inquiry — are that the president only gave the job to the former Alabama senator because of personal loyalty in the 2016 presidential campaign. And Sessions has never asserted himself at the Justice Department, as Trump told Fox News in an interview broadcast on Thursday. "The Dems are very strong in the Justice Department," he said. "I put in an attorney general that never took control of the Justice Department, Jeff Sessions. Never took control of the Justice Department. And it's — it's sort of an incredible thing." Trump has said how much he regrets appointing Sessions because the attorney general recused himself from the Russia investigation. The president was asked about speculation that Sessions may be fired after the election. "Well, I'll tell you what, as I've said, I wanted to stay uninvolved," Trump said in the Fox interview. "But when everybody sees what's going on in the Justice Department — I always put 'Justice' now with quotes — it's a very, very sad day." Sessions insists he did nothing wrong in the 2016 presidential campaign but said he felt he could not be involved with an investigation of it because of the role he played. "When you evaluate the rules, I feel like that I should not be involved investigating a campaign I had a role in," Sessions said in early March 2017. That's why it fell to Deputy Attorney General Rod Rosenstein to appoint special counsel Robert Mueller after Trump fired former FBI Director James Comey later in the spring of 2017. Mueller took over the FBI's investigation into the Russian attack on the 2016 election and whether Americans were involved, including people on the Trump campaign. Sessions was an early endorser and supporter of Trump; he met a few times during 2016 with Russia's then-ambassador to the United States, but insisted to Congress he hadn't done anything nefarious. Trump and his allies, especially Republicans on the House Judiciary Committee, have been sandblasting the FBI and Justice Department for months with complaints about "bias," abuse of power and unfairness. The rhetoric is trickling down; when House Rep. Duncan Hunter, a California Republican, was indicted by a grand jury this week on charges of misusing campaign donations, he accused the Justice Department of what he called another baseless hit, echoing Trump. Federal law enforcement made life uncomfortable again for the White House this week: On Tuesday, Trump's former campaign chairman Paul Manafort was convicted on tax and bank fraud charges in the Eastern District of Virginia, a case brought by Mueller's office. The same day, Trump's former longtime personal lawyer Michael Cohen pleaded guilty to campaign finance and other violations in the Southern District of New York. Cohen's statement directly implicated Trump's role in payments that Cohen had made to keep two women silent who have said they had sexual relationships with Trump. That case was referred to authorities in New York by the special counsel's office. Senators have so far stuck by their longtime compatriot through his break with Trump; Republicans have suggested in the past that they would not be amenable to confirming another attorney general if Trump tried to fire Sessions over the Russia matter. There are some new signs, however, that support for Sessions may be weakening. Senate Judiciary Committee Chairman Chuck Grassley, an Iowa Republican, runs the committee that would be responsible for confirming a new attorney general. He told Bloomberg on Thursday that the door might now be open to hearings for a replacement. And Trump's sometime ally Sen. Lindsey Graham, R-S.C., who also sits on the Judiciary Committee, said that he thought the president is entitled to have somebody leading the Justice Department in whom he has confidence. "I don't know if he's going to fire Sessions or not, but you don't have to be Dr. Phil to understand that they don't get along well," Graham told reporters on Thursday. Texas Republican John Cornyn, on the other hand — who both sits on the Judiciary Committee and serves as the Number Two Republican in the Senate — stood by Sessions on Thursday. "He's a quintessential Boy Scout ..." Cornyn said. "And I know this is a difficult position for him to be in but I think it would be bad for the country, it would be bad for the president, it would be bad for the Department of Justice for him to be forced out under these circumstances. So I hope he stays the course and I hope cooler heads prevail." President Trump continued his war of words against his own attorney general today. On "Fox & Friends," the president blasted Jeff Sessions. PRESIDENT DONALD TRUMP: He took the job, and then he said I'm going to recuse myself. I said, what kind of a man is this? CORNISH: Then, in a rare bit of self-defense, Sessions pushed back. Here to talk more about the controversy is NPR national justice correspondent Carrie Johnson. Hey there, Carrie. CORNISH: So first, just the reasons why President Trump is at this point so upset with his attorney general. JOHNSON: Yeah. Jeff Sessions was one of the first members of Congress to support candidate Donald Trump. But after he recused himself from the Russia investigation, the president basically hasn't been able to forgive Jeff Sessions. The president goes back to that issue again and again. Trump's been blasting the attorney general on Twitter and again today on television. Trump told Fox News that Sessions is not in control of the Justice Department, and he says Sessions only got this job because he was loyal to Trump during the campaign. CORNISH: What did Jeff Sessions have to say about this? And I know we've been calling this an unusual response. How come? JOHNSON: Yeah. I can't remember a time when Jeff Sessions has actually pushed back to criticism from the president. He issued a statement today saying, actually, I took control of the Department of Justice the day I was sworn in, which is why we've had an unprecedented success in pushing forward with this president's agenda, things like reducing violent crime, enforcing immigration laws and advancing religious liberty. Sessions also added importantly while I am the attorney general, the actions of the Department of Justice will not be improperly influenced by political considerations. In other words, back off, Mr. President. He also added no nation has more talented or dedicated law enforcement investigators than the United States. Now, shortly after that statement came out, Jeff Sessions was spotted at the White House. There was a little panic about that. Like, oh, is he about to lose his job? The Justice Department says he was there for a previously scheduled meeting on justice reform issues. CORNISH: Right. But as soon as you bring up that panic, I think that's a reminder that President Trump hasn't really given Sessions job security, right? Will he stay on as head of the Justice Department? JOHNSON: Our colleague Kelsey Snell is on Capitol Hill today. She's been asking Republican lawmakers about Jeff Sessions. They say the president's very frustrated, but firing the chief law enforcement officer is not a good idea. Here's Texas Senator John Cornyn. He's a member of Senate leadership. JOHN CORNYN: And I know this is a difficult position for him to be in, but I think it would be bad for the country, it'd be bad for the president, it'd be bad for the Department of Justice for him to be forced out under these circumstances. JOHNSON: Recall that before he became attorney general, Jeff Sessions was actually a member of the U.S. Senate for 20 years, so he still has a lot of fans there. And the mood is pretty tense right now. Lawmakers told Kelsey Snell they don't have a candidate who could be confirmed as attorney general if Sessions gets the boot. They don't have time to confirm somebody else. That means the president would have to live with Rod Rosenstein, the deputy attorney general, who he doesn't like that much either. CORNISH: Right. Any implications for the Mueller investigation if there's a shakeup there? JOHNSON: Yeah. Robert Mueller is supervised by Rod Rosenstein. Jeff Sessions is out of the picture because of his recusal. So if Sessions goes, the president could name an attorney general who would have more control over Bob Mueller and the entire Russia investigation. That could create a huge uproar in law enforcement and political circles.